It’s not possible to take Zen out of Shaolin martial arts because Shaolin martial arts were born from Bodhidharma, the founder of Zen. Shaolin Martial Arts is a pathway to Zen. How is this possible? Because the movements cut through the thinking mind. This thinking mind is not the mind that experiences Zen. We have another mind. A mind that cannot be approached from a thinking perspective. A mind that is untouched by our thinking or anything we have done or anything that has been done to us. Zen Buddhists call it our Pure Light Mind. You can think of it as basic goodness that exists in all of us. We all have it. It’s our potential to become a Buddha. Buddha simply means awakened one. Someone who has woken up to see the world as it really is. If we throw some red dye into the sea, it will not turn the sea red, as the sea is so vast and expansive. Our minds have the capacity to be vast and expansive too yet if someone shouts at us or insults us, we tend to get angry, this is a measure of how expansive our mind is and how much work we need to do. I have a lot of experience of anger. When I was 15 years old, I was always getting into fights. My Master – who is now the Shaolin Abbot – was fed up of coming to the police station to get me out of jail so he sent me to a very well known Zen master. 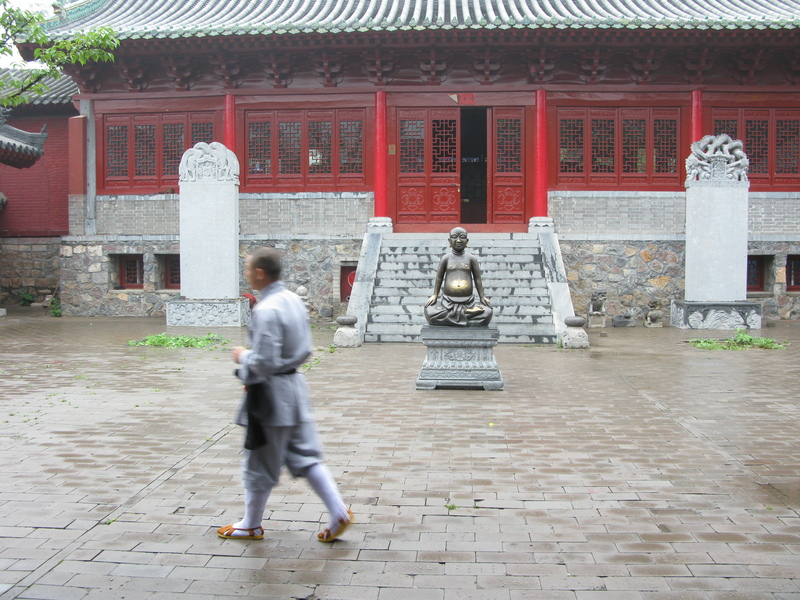 In the Cultural Revolution when Mao was destroying all the temples, this master risked his life to stay in the temple. For many years he lived in this destroyed temple and when Buddhism was allowed to flourish again he started to re-build the temple. Every morning he would sit in meditation and chant and I would train. He asked me to sit with him but I had no patience to sit. After a few weeks of trying to get me to sit he told me to make training my meditation. That sentence has resonated with me all my life. 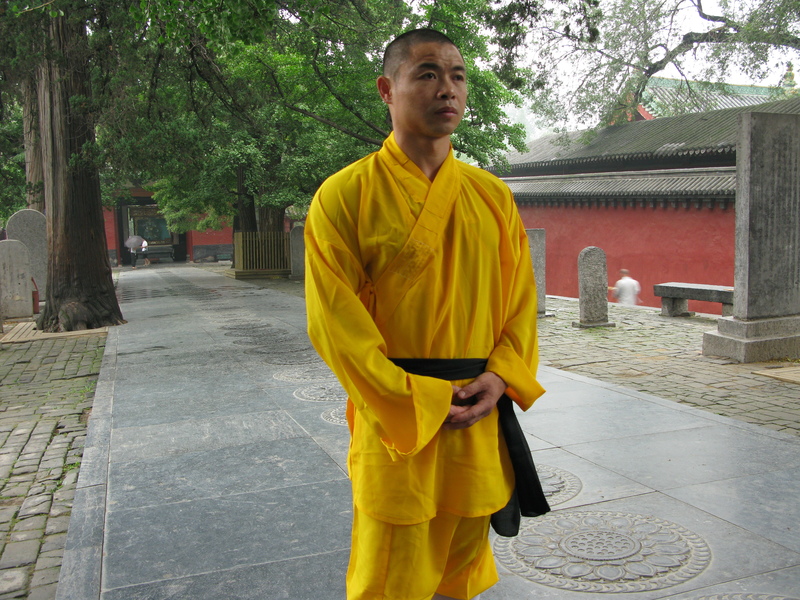 When I came back to the Shaolin Temple, my training was no longer a series of exercises or a way of being able to learn new fighting techniques so that I could conquer other people but it became my meditation. 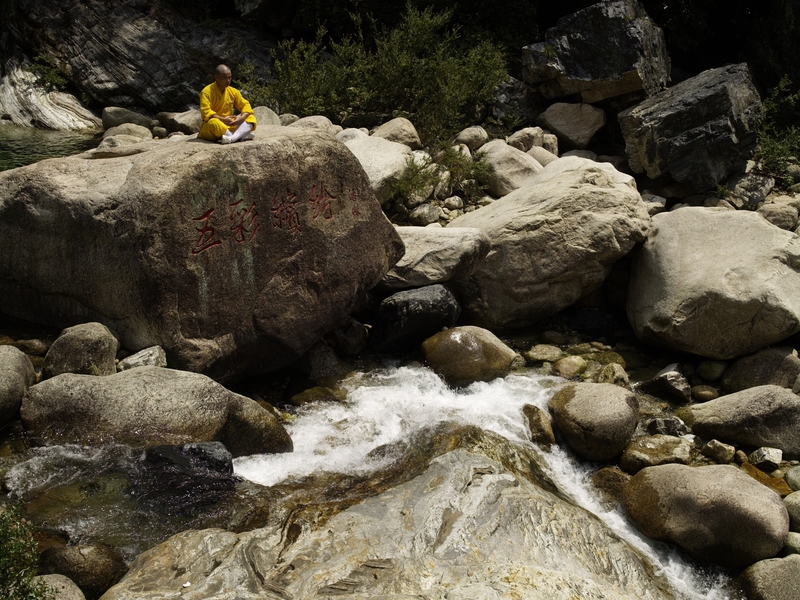 To train in Shaolin doesn’t mean we need to become Buddhists or believe in the Buddha. I don’t see myself as a Buddhist even though I come from a Buddhist Temple. I see myself a martial artist with a wish to understand life. A wish to not get pulled in by my unhelpful emotions and a wish to increase my helpful emotions. I see the Buddha as a wonderful psychologist who had a great understanding about how our minds work. So whenever you train, and whatever you train in, use your training as your refuge and your meditation. This will install peace and strength in you. This will mean, however difficult your life is, you always have something to come back to, something you can rely on. Willpower is like petrol, it runs out. 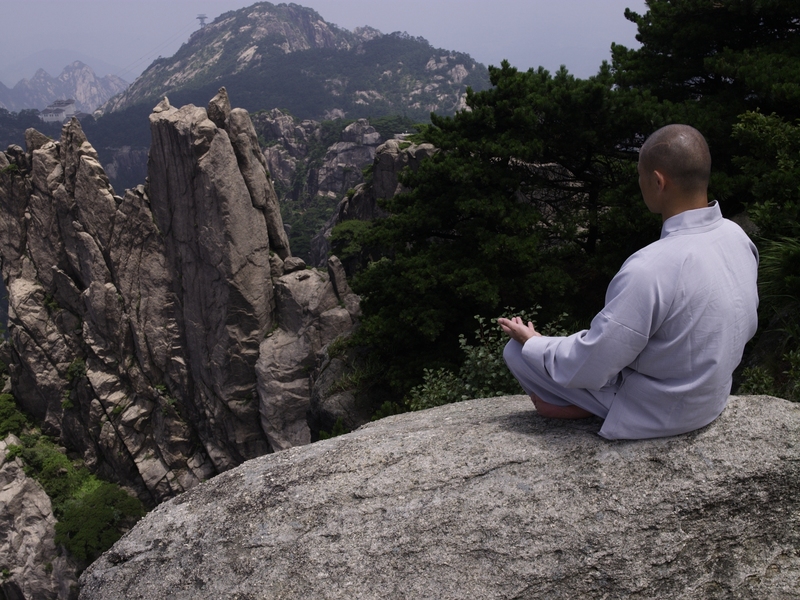 This is why Shaolin Monks cultivate daily habits so it becomes a part of our life. If you are coming on my Shaolin Summer Camp this year then you will live in this way so you can take home some of those habits that you’ve cultivated. Without moving a muscle, imagine you’re training with me in China. You wake at 6am, hurry into your training clothes and begin your run up the mountain. You still feel sleepy, your muscles are tight from yesterday’s training, and the first bit of the run feels difficult. But soon your body warms up and as you breath in the fresh mountain air; you discover an energy you never had before. Back at the school, your Five Fundamental Kicks that felt tight yesterday feel flexible, your stances feel grounded, and there’s a flow to your forms. We are what we repeatedly do and this everyday experience of Shaolin enables you to finally tune your body so it’s working at it’s optimum. Just like the strings on a guitar, your body is learning to be neither too tight nor too slack. It takes practice to be this natural. Now bring yourself back to your computer screen or your smart phone or whatever you’re reading this article on. Just as I had never tasted coffee until I came to the West – and was surprised by its bitter taste – Shaolin cannot be expressed in words. The experience has to come from you. If you can’t come to my Summer Camp, you can create your own Shaolin environment through training at your local school or in your home with my DVDs and downloads. 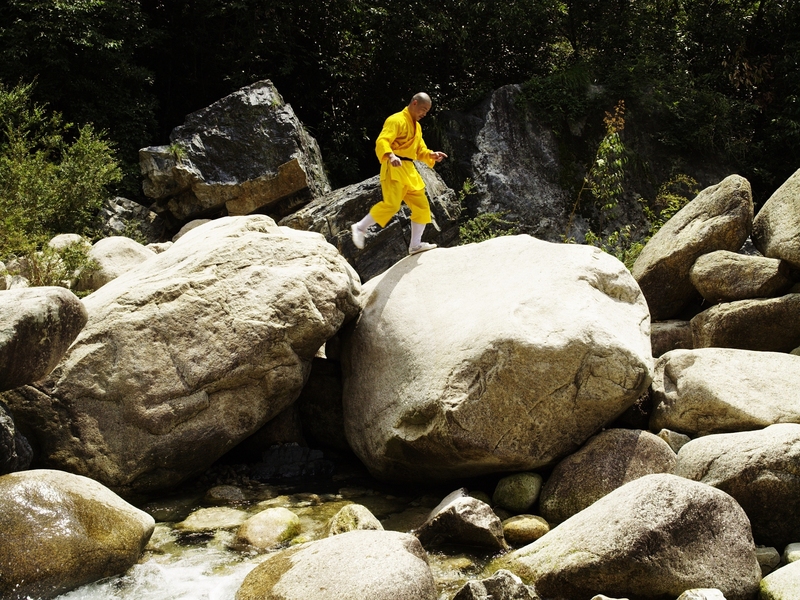 Shaolin is about training your heart and your heart can only be found where you are. Sometimes I get emails from people who say it’s always been their dream to learn Shaolin. They come for a session with me and after the session, I know I will never see them again. For some people, they prefer to hold onto a dream. Reality is too different from their dream. Please don’t be this person. It means you can never reach your true potential. If Shaolin isn’t for you, that’s fine, but if you feel drawn to it then see it through. It’s similar to the Buddhist parable of the man who loved dragons. Everything in his home had a picture of a dragon on, his bedspread, his toothbrush, his cups, his plates etc but when a real dragon popped his head through the window to say good morning, the man ran away terrified. Don’t be afraid to be the best you can be. Don’t be afraid to be healthy and strong and fit. Don’t hide behind illness and injury and excuses such as lack of time. Martial Arts creates time because it makes you more focused in your life. The beauty of any martial arts is there is no victory or defeat. We all train at our own level. One stance is as challenging for an advanced student as it is for a beginner. Success is making 100 percent effort to perform at the highest level of your ability. Success is being your own champion. There’s an ancient Buddhist story about a wrestler who wore a precious jewel in his hair. During a match, he received a blow to his head. Without him realizing it, the jewel dropped into his wound. When the wound healed, the jewel was covered by a scar. Every day the wrestler looked for his jewel, never realizing that it was inside him all the time. This is the same for all of us. Peace and enlightenment are not and never have been outside our mind. All we have to do to access this great peace is come back to our natural state of being. Just as the wrestler lost his jewel through acts of violence. We lose connection with our natural peaceful state when we give into anger, aggression and other emotions that don’t increase our or other people’s happiness. Modern life puts a strong focus on looking outwards at some future time when things will be better. What we want – whether that’s peace or a better life – is always out there and one step away. But what this teaching instructs is: we already are what we want to become. It’s already within us. If we look beneath our hurts, disappointments and wounds, we can rediscover our jewel. Whenever I feel disconnected from myself or my mind is turbulent I practice Qigong or Rou Quan and it doesn’t take long before my mind goes back to its natural state of peace. Daily practice of Qigong changes the neural pathways in our brain. The founder of Zen, Bodhidharma gave us a roadmap that shows us clearly how to use Shaolin Qigong and Kung Fu as a pathway to Zen. This spacious peaceful state of mind is not only reserved for Shaolin monks but for everyone, those of any religion and those of none. Habit energy drags us down. So set yourself small reminders that you’re on the path of the Urban Shaolin Warrior. This can be uplifting pictures and quotes from people that inspire you or – like the Shaolin Monks do – wear a Jade amulet or mala so the reminder is with you all the time. And practice Shaolin at least four times a week, even if it’s just 5 minutes a day, this is much more beneficial than a long once a week practice. And don’t forget to share how you get on in the comments below or by tweeting me. Instant Health: The Shaolin Qigong Workout is available as a book worldwide & in the USA & Canada an ebook on apple & amazon. 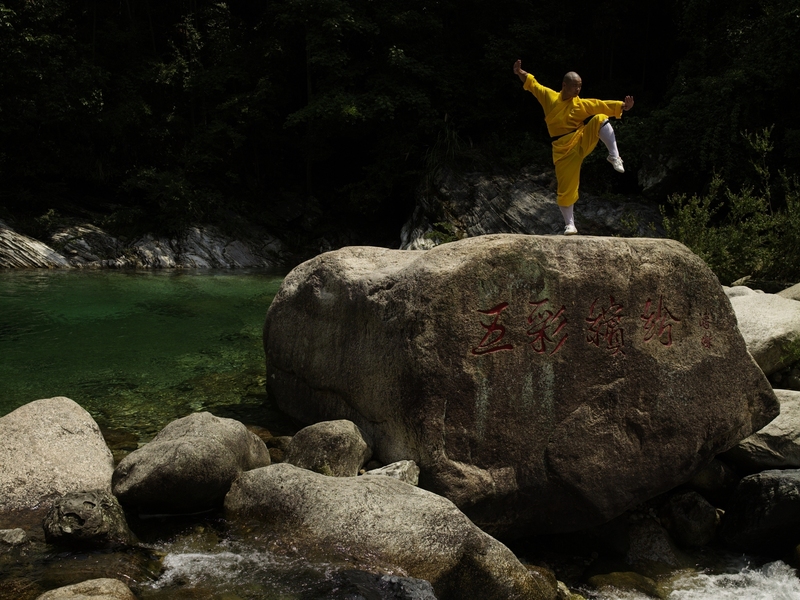 Shifu Yan Lei teaches Qigong as a DVD and download and Kung Fu as a DVD and download. Jade wrist malas and amulets come from Shifu’s province in China.